Queen Elizabeth II became the longest-reigning monarch in British history on the evening of 9 September 2015. 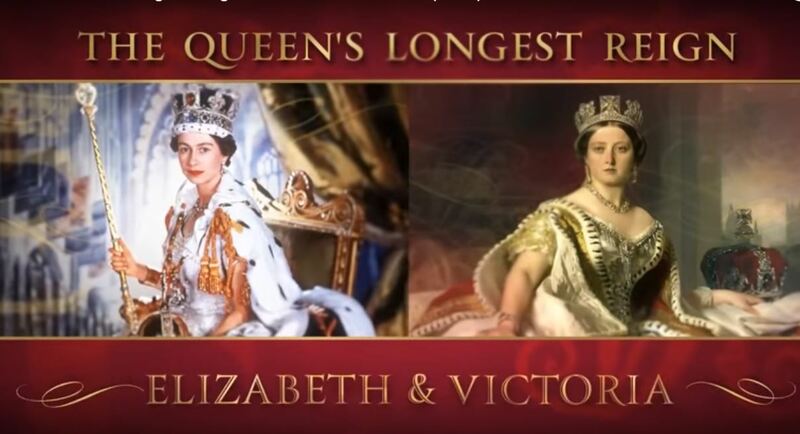 This documentary compares the lives and the reigns of two extraordinary women who have steered their courses through periods of remarkable change: Elizabeth and Victoria. It follows Queen Elizabeth II on engagements in the UK and abroad as she approaches this historic date. With interviews and archive to illustrate the remarkable stories of these two female monarchs. Speaking in the Scottish Borders, the 89-year-old monarch said the title was "not one to which I have ever aspired". The Queen will have reigned for 63 years and seven months - calculated at 23,226 days, 16 hours and approximately 30 minutes at about 17:30 BST. Dressed in turquoise with her trusty black handbag at her side, the Queen spoke briefly to the gathered crowds on the day she passes the record set by her great-great-grandmother Queen Victoria. She said: "Inevitably a long life can pass by many milestones - my own is no exception - but I thank you all and the many others at home and overseas for your touching messages of great kindness."